Background: Naringenin belongs to the class flavanones, and chemically it is known as 5,7-dihydroxy-2-(4-hydroxyphenyl) chroman-4-one. It is one of the dietary poly-phenolic constituents of the citrus fruits and vegetables. Naringenin possesses excellent antioxidant, antiinflammatory, and antimicrobial activities. These activities promote wound healing activity. Naringenin has been incorporated in the gel base to be applied on the wounded skin. The wound healing property of naringenin gel has not been studied extensively in the literature to date. Objective: The present study aims to unveil the wound healing property of naringenin gel formulation on excision and incision model. Materials and Methods: 0.5% and 1% naringenin was incorporated in a carbopol gel base formulation and evaluated for physicochemical parameters. Incision and excision wound models were used to study wound contraction, tensile strength, healing index, the period of epithelization and histopathological parameters. Antimicrobial activity was performed using agar plate method. Results: Naringenin (0.5% and 1%) treatment shows a significant increase in the percentage of wound contraction, good healing index and shorter epithelization period. Histopathology of naringenin gel treated wound tissue showed more fibroblasts, less macrophage infiltration, and wellformed collagen fibers as compared to control. In incision wound model, the animals were treated with 0.5% and 1% naringenin gel for nine days and showed a significant increase in the tensile strength. Naringenin exerts antimicrobial activity against fungus and E. coli. 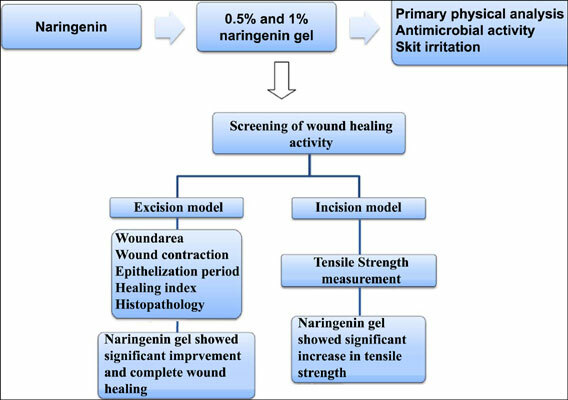 Conclusion: The present study explored potent wound healing activity of naringenin gels. Excision wound, incision wound, healing index, tensile strength, naringenin, collagen fibers.